Emmons fired at the lane three target from lane two. It was the best of times. Then, it was the worst of times. After U.S. shooter Matt Emmons won his first gold medal Friday, he blew his lead -- and a second gold medal -- after shooting at the wrong target Sunday. The error, on Emmons' final shot, dropped him from first to eighth. U.S. teammate Michael Anti benefited, moving into second for the silver. Olena Kostevych needed an extra shot to win her gold medal. Russia's Alexei Alipov ended the suspense early in his victory. 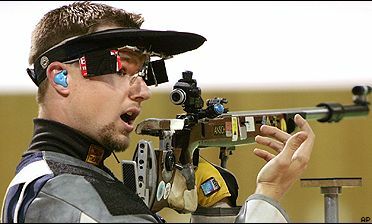 Two Russian shooters set Olympic records during qualification in air rifle and air pistol events Saturday. Li Du of China won the Summer Games' first gold medal Saturday, setting an Olympic record in the women's 10-meter air rifle. At 52, Elizabeth Callahan is the oldest Olympian on the American roster. A former police captain, she competes in shooting. Matt Emmons became the first American to qualify for one Olympics in three shooting events, when he won the three-position competition at the U.S. trials on Monday. Koby Holland and Adam Saathoff qualified for the Athens Olympics in running target after taking the top two spots at the U.S. shooting trials Sunday. Matt Emmons qualified for the Athens Olympics in a second event Thursday when he finished first in prone rifle at the U.S. shooting trials. Jason Parker earned a spot on his second straight Olympic team, and Matt Emmons, Sarah Blakeslee and Morgan Hicks each qualified for their first at the U.S. shooting trials on Sunday.